NEWTON GROVE, North Carolina, October 2, 2018 – Prevent farm accidents caused by climbing feed bins to check feed content levels with Hog Slat’s Bin Stik. The Bin Stik provides a safe and affordable solution for farmers to easily and quickly check feed bin content levels from the ground by tapping or rubbing the high-density polyethylene ball tip along the side of a bin and listening to the difference in sound between full and empty sections to determine feed levels. The lightweight telescoping aluminum pole weighs only 2.5 pounds. It extends to 142 inches in length and closed length is 78 inches for easy storage. “Climbing feed bins to check feed levels can be a dangerous job, especially when wind, rain, snow or ice is involved. The Bin Stik offers an easy solution for farmers to monitor their feed bin levels without risking their safety or their worker’s or family’s safety to climb up the feed bin ladder. While most other feed management systems rely on expensive software and electronics, the Bin Stik provides farmers an economical and simple solution to measure feed inventory” says Hog Slat National Retail Manager Alan Riley. 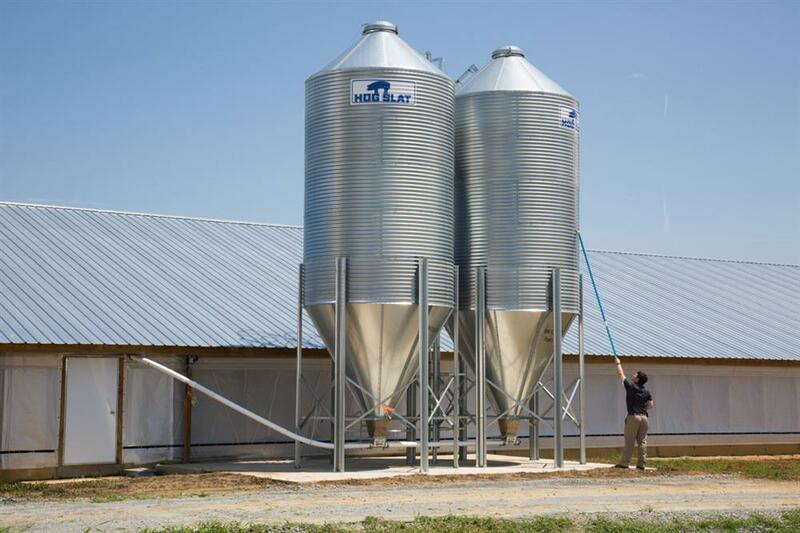 Safely, easily, and quickly check feed bin content levels from the ground with Hog Slat’s telescoping Bin Stik.